The Georgian WGM started the tournament from the sensational victory over her compatriot Baadur Jobava (2722). 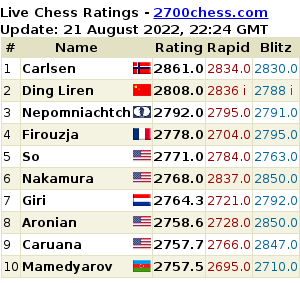 The next ones to be outwitted by her fragile hands and smart brain were GMs Gabriel Sargissian (2687), Chanda Sandipan (2603) and Wen Yang (2586). Besides, she held against Ivan Salgado (2622), Hisham Hamdouchi (2616) and Alexander Rakhmanov (2636). Only Milos Perunovic and Danill Dubov managed to beat the female hero. In the end, Khotenashvili has scored 5.5 points out of 9, which brought her the first female prize equal to $ 5.000. 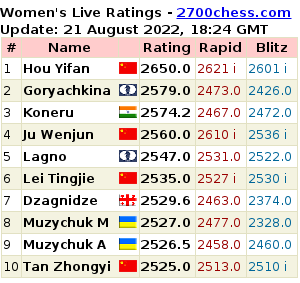 Chinese WGM Ju Wenjun (2582) has got 5 points, the other women players have performed even worse. Nigel Short has achieved a big success in the strong Poker Stars open on the Isle of Man, winning his last round game over David Howell and taking the clear 1st place with 7.5 points out of 9.